NEMO Kunai 2P Tent. 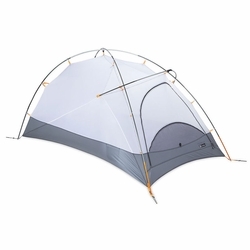 The most versatile tent on the market for backpacking year round. The first all-mountain tent in the category, Kunai™ stands apart for being able to offer security and comfort from the glacier to the summit. A large overhead vent opposite the door promotes good air circulation. A large overhead vent opposite the door promotes good air circulation. The ridge pole keeps the vent properly tensioned and provides an awning over fabric window that can be opened and closed from the inside to expose mesh.